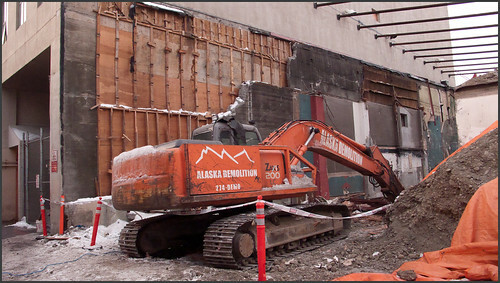 A week ago I walked by the old Empress Theater building on 4th Ave. to see if it had been torn down yet. It had. 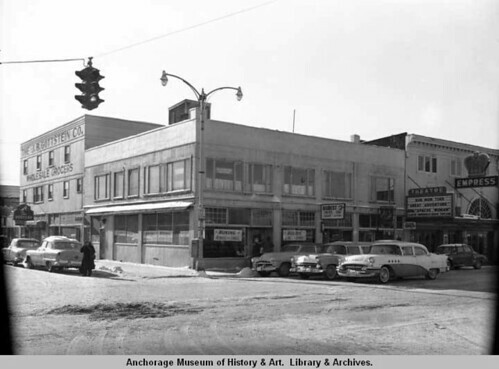 The building was removed to make way for a mid-rise tower that will adjoin and convene the existing Anchorage State Legislature office building. Looking north at the demolished theater building from the alley side. The overhead braces are holding up the east wall (on the right), a concrete wall original to the building that I suspect is being left in place for a reason. I hope it’s more to act as a fire break to the wood 1917 two and three story building next door — and not that developer Pfeffer is qualifying for historic preservation funding (wouldn’t that be ironic?). Part of the remaining west wall of old theater building against the 1970s tower that is the current Legislative office building. 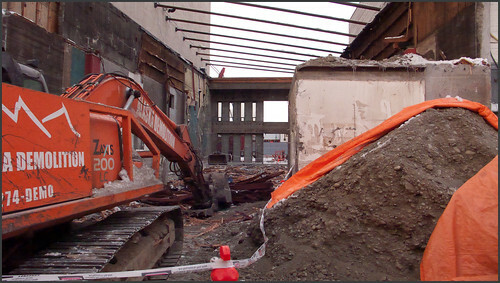 Looking through the old auditorium at the north wall of the lobby/facade at the street side. It appears that the original wall had its opening modified and the new facade was bolted to it in the 1960s when the building stopped being a theater and became a bank. I worked in Mark Pfeffer and his partners’ architectural firm from 1994 through 2000. Lots of interesting memories. Man, can that guy cut a deal, or what? Yes, he can — on better terms than absolutely anybody. That aspect isn’t surprising — but I didn’t think he would tear down the building. In the early 2000s the Ginza Restaurant occupied the old theater building. Once after work I went there with Pfeffer and some others from the office — and Mark asked to see a set of 8×10 photos taken in the early years of the Empress — showing the interior, balcony, uniformed ushers and the proscenium. They were in a manila envelope at the bar. [Perhaps the photos were some others by P.S. Hunt, prolific photographer of Valdez, early Anchorage and the Alaska Railroad.] Mark showed them to me, knowing I would be interested. I was, very much! I know that Pfeffer also was a supporter of Anchorage Historic Properties, Inc., an agency that managed some of Anchorage’s extant historic homes and commercial structures and made recommendations on ways to preserve others. I can’t find any trace of that organization today, though — was AHPI absorbed into the MOA Planning Dept. in 2007? 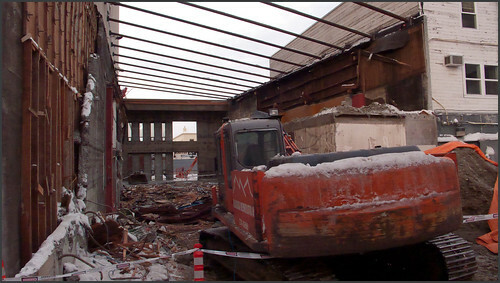 The MOA doesn’t have much to say about historic preservation on their web site. One can find the 1986 MOA Preservation Program document there, and not much else. 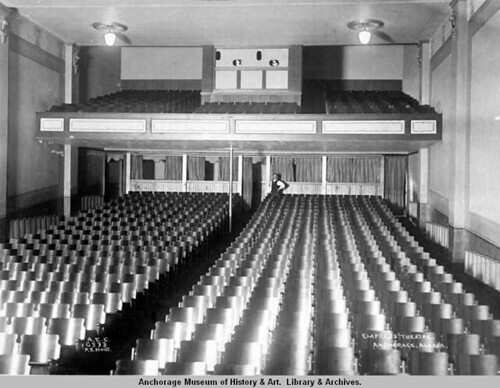 Theater interior in 1917, showing the proscenium and movie screen at the south end of the auditorium. Can also see the organ that was used for silent film accompaniment. The proscenium was removed in the ’60s remodel. Looking the other way (north) in 1917 at the balcony, aisles and front exit through the lobby. 6. 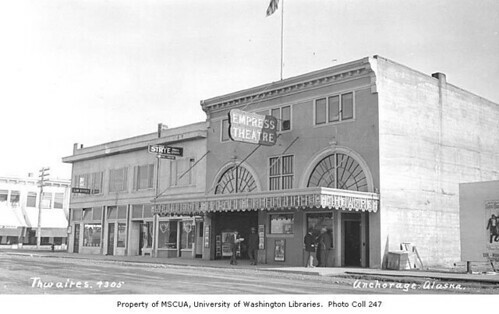 Anchor Pub/Empress Theater: Before Cap Lathrop crowned his career with the grand 4th Avenue Theatre, he constructed a chain of theaters in Cordova, Fairbanks and Anchorage, each named the “Empress.” Visit the Anchor Pub today on Fourth Avenue, and you can still see the balcony and the slight slope of the floor. I was really surprised when I realized sometime in the ’90s that the Empress building in Anchorage was still there. The thorough remodel of the 4th Ave. facade hid it pretty well, but it revealed itself when viewed from the alley. The 60′-6″ wide 1917 Alaska Building on the corner of 4th and G and the 39′-6″ wide Empress occupied the first two 50 ft wide x 140 ft deep lots on the block. 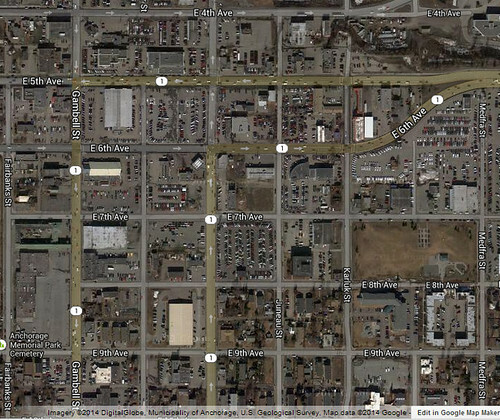 Anchorage’s downtown is a rigid grid of 300 ft square blocks with 60 ft wide street right of ways between. Twelve 50 x 140 lots per block with a 20 ft wide alley between. 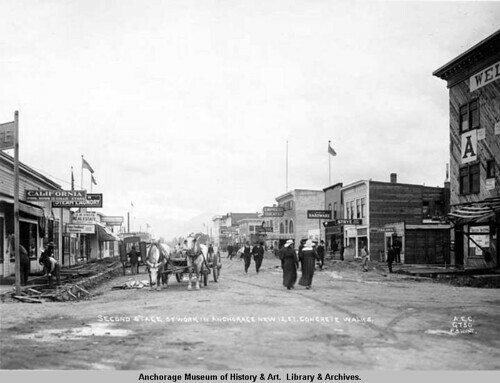 For the first few years all of the commercial buildings were on 4th Ave. and the other blocks north and south were scattered with small, mostly wood framed houses. 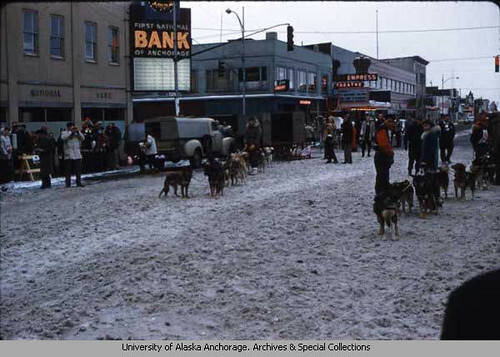 Alaska Building and Empress Theater in 1956. Empress Theater in Feb. 1958. The Empress, built out of concrete in 1916 was a rarity. It is mind blowing to think of a smattering of citizens watching silent movies in there when everything south of 9th Ave. was wilderness. It must have been a nice luxury in the tiny town! Empress in 1917 near the middle of the frame. Looking east on 4th Ave. The road is still unpaved but 12 ft wide concrete sidewalks are being poured for the first time. In the ’60s the Empress was thoroughly remodeled and became a branch bank. It was still used as a bank and adjoined to the new six story tower next door in the ’70s and ’80s. Sometime in the ’90s the connecting door was sealed up and the old theater became a series of different restaurants and cocktail lounges. Through it all, the old theater was still visible — the wall pilasters, balcony platform [without the slope, risers and seats but with the stairs still in the same place] and 19 ft high former auditorium space attesting to its former life. 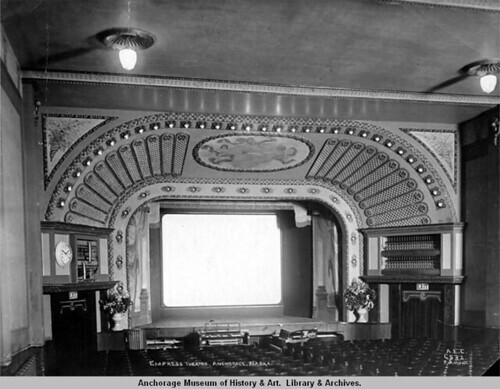 The theaters were the brainchild of Captain Austin E. ‘Cap’ Lathrop, a magnate of old Valdez and old Anchorage. They were a way to give back to the state and its people, in recognition of a long and successful career in mining and development — back when magnates felt obligated toward such grand gestures [hint, hint, Mark!]. Lathrop’s been dead since 1950 but still occasionally writes on his Facebook page, when he isn’t haunting his buildings. Update 1/5/14: A structural engineer friend informs me the Empress’s east wall was left in place because part of the structure of the Alaska Bldg. next door is hung from it. They don’t build ’em like they used to, eh? 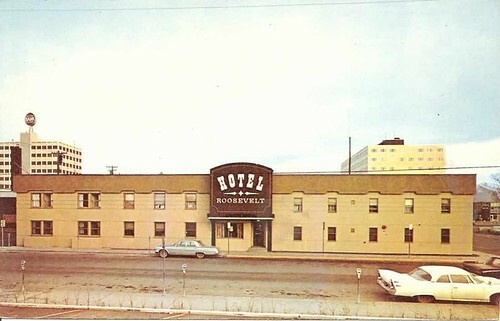 Roosevelt Hotel, later the Inlet Inn, 1960s view looking east at 6th Ave. and H St.
Another downtown building Mark Pfeffer tore down this year — now vacant property. In the view above it is about halfway between its transition from a respectable establishment and good example of the second era of Anchorage’s history to the fleabag den of iniquity and suffering it became at the end. In the ’90s the original wood double hung windows were removed and the original concrete wall detailing covered with vinyl siding. It continues to amaze me that Anchorage takes such a cavalier, disaffected stance on preserving traces of what happened here. We continue to push the boundary, rolling our low scale sprawl across the whole Anchorage bowl and up into the foothills. And complain that we’re out of space, while we obliterate the old settlement pattern and turn what used to be residential blocks and boreal forest into acres of surface parking. I can’t blame individual developers so much — it is a defect in our collective thought on the best way to accommodate population growth. East downtown Anchorage development pattern.